Oldsmobile has been gone for almost a decade, and most have forgotten the legacy it left behind. From the late-1980s until 2004, Oldsmobile’s model offerings were bland and unappealing. Buyers ran away from Oldsmobile like it was the plague. And as Oldsmobile tried to revamp its image with the “Not your father’s Oldsmobile” marketing campaign, younger buyers didn’t seem to be interested. Only a small group of loyal Oldsmobile buyers remained, many of which were members of the senior citizen community. Oldsmobile spent its last two decades whittling away its great automotive legacy. Most people today either don’t remember or are too young to remember when Oldsmobile produced desirable world class automobiles. Not to mention that Oldsmobile provided hot performance V8 engines years before Pontiac and Chevrolet. Oldsmobile and Cadillac were the first automobile brands to mass produce the overhead valve (OHV) V8 for the 1949 model year. Oldsmobile marketed its new V8 engine as the “Rocket V8”. The Rocket V8 became a legend in its time and laid the initial ground work for the upcoming muscle car era since the original muscle car time period would have never existed without the OHV V8. Another legacy Oldsmobile had successfully forged was it offered reasonably priced luxury and sporty cars to buyers who desired a more upscale car than what the run-of-the-mill automakers like Chevrolet, Ford, and Dodge provided at the time. Where many muscle cars buyers back in the golden era, opted for stripped down cars with not many options, Oldsmobile buyers were generally the polar opposite. Oldsmobile’s premiere muscle car of the 1960s, the 442 (or sometimes referred to in past Oldsmobile sales literature as the “4-4-2”) was the choice muscle car for those wanting an upscale high performance muscle car. The 442 started out modestly as a performance package for the 1964 F85 and Cutlass. For 1964, “442” stood for a 4-speed manual transmission, a 4-bbl carburetor, and dual exhausts – all of which were standard. The downside was the 1964 442 was only equipped with a small-block 330 cubic-inch V8. As a comparison the 1964 Pontiac GTO came standard with a 389 cubic-inch V8. By 1965 the 330 V8 was no longer available for the 442, it was replaced with a big-block 400 cubic-inch V8 and the rest as they say “is history”. 400 cubic-inches was the displacement limitation of the 442, due to an internal GM corporate ban on engines with larger displacements (of more than 400 cubic-inches) in its mid-sized cars. For 1970, the internal GM ban was lifted and the 442 had as its new standard motor Oldsmobile’s big-block 455 cubic-inch V8 which was rated at 365 gross horsepower and a whopping 500 lb-ft of torque. Yet, the real news for 1970 was the optional W-30 455 V8 – rated at 370 gross horsepower and 500 lb-ft of torque. A 5 horsepower difference didn’t seem like much however the W-30’s advertised horsepower figure was underrated by Oldsmobile, true horsepower output was a little over 400 horsepower. The 1970 442 W-30 455 would be Oldsmobile’s ultimate muscle car, nothing before or after would surpass its legendary status. 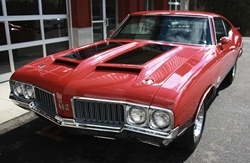 By 1970, Oldsmobile fans were already accostumed to the idea of a 455 V8 offering for the 442, since Oldsmobile had bypassed GM’s displacement mandate by an agreement with Hurst Performance, INC. for 1968 and 1969 – which had created the 1968-1969 Hurst/Olds (a high performance 455 V8 powered low production car based on the 442). The 1970 W-30 455 V8 was not just a high performance 455 V8 that Oldsmobile dropped into the engine bay, it was an entire performance package for the 442. 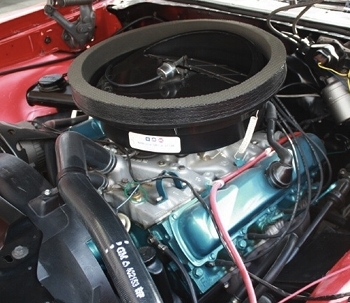 With the W-30, the W25 package was standard which included a fiberglass hood with two large air inlets that fed fresh air into a free-flow air cleaner assembly. The fiberglass hood had two large hood stripes and two functional ornamental chrome hood tie-downs. The W-30 also included a performance tuned Rochester Quadrajet 4-barrel carburetor, a high performance cam, and a lightweight free-flow aluminum intake manifold. A set of high-performance cylinder heads and exhaust manifolds were also part of the package. The W-30 had enough horsepower and torque to frighten most drivers when the accelerator pedal was pushed to the floor. The feeling was like a Boeing 747 at takeoff – the sudden powerful movement forward threw you back into your seat. However the real scare came from trying to keep the W-30 powered 442’s skinny (by today’s standards) rear tires planted when launching from a stop. The net effect was lots of smoke and screeching rear tires, too much throttle could send the 442 rocketing off the road and into a tree or another obstacle or burning the tires to oblivion. This was the reason why the most potent muscle cars by 1970 were so costly for younger buyers to insure. Today it’s hard to imagine what precise driving skills were needed to rocket an ultra powerful car like this under heavy acceleration – it was a careful balance of applying just enough pressure (at the initial launch) to the accelerator pedal to get enough traction so that the accelerator pedal could then be mashed to the floor. Add to this, the dynamics of (if equipped with a manual transmission) the fine art of speed shifting. Then you soon realize that it took a very skilled driver to be able to harness the power of these wild animals called vintage muscle cars. By comparison, today new high powered rear-wheel drive high performance cars (like the 2012 Ford Mustang GT, 2012 Chevrolet Camaro SS, and 2012 Dodge Challenger SRT8) are so easy to control even during full throttle, due to standard traction and skid control – the computer compensates for any mistakes and makes these cars almost idiot proof. Back in the day when mistakes were made with cars like the 442 W-30 under heavy acceleration when not in the hands of a skilled driver, the end result could be very costly if not fatal. A W-30 equipped 1970 442 (equipped with a 3.91 rear axle) with a skilled driver could back in the day obtain a quarter mile of 13.9 seconds at a little over 100 mph, in 1970 this was lightning quick. Muscle cars like the W-30 442 were certainly not for the faint of heart. Though it had a lot of youth appeal many of the 1970 442 W-30 buyers were a little older than the average muscle car buyer and were usually higher on the socio-economic ladder. Oldsmobile did offer the 442 and even the W-30 with the 2-door pillared coupe (Oldsmobile called it the “Sports Coupe”) however there weren’t many takers. The 442 Sports Coupe had a fairly competitive base price of $3,100. However the 442 Holiday Coupe which was pillar-less (between the front and rear side windows) was only $60 more, so it was no surprise why the Holiday Coupe was the big seller. Even the optional convertible had a very reasonable base price of $3,341. However Oldsmobile being an upscale GM division offered a laundry list of options on the 442 for 1970, and many buyers loaded up on these options which elevated the price substantially. By 1970 American buyers were beginning to flock to Oldsmobile’s (GM) A-body – the Cutlass. It would be a trend that would continue throughout the 1970s and early-1980s and eventually make the Cutlass, GM’s most popular A-body. 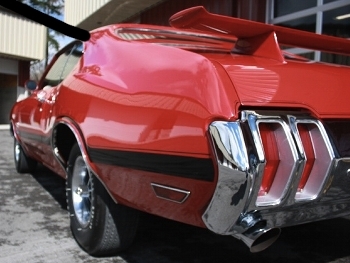 The 442 for 1970 took the best of the 2-door Cutlass and added all the exterior touches muscle car buyers demanded. The front end had the distinctive and attractive Oldsmobile front grille treatment which included four round headlights. The 442 was even available with an optional rear wing spoiler. The W-30 package was $719.34 when ordered with power brakes, without power brakes the cost rose to $741.45. The W-30 package included a reduction of sound deadening material and a set of red plastic front inner fenders as weight saving measures. Dual sporty mirrors and horizontal body length side stripes were also standard on the W-30. All of these standard goodies provided the W-30 442 with the look of a genuine muscle car. Both the Sports Coupe and Holiday coupe had the sleekest roofline of any 1970 GM A-body – it was a semi-fastback design that gave the W-30 442 a sleek look especially when equipped with the optional rear wing spoiler. The rear design also blended well with the semi-fastback styling – it was a large chrome bumper which housed the vertical rear taillights (two on each side of the rear bumper). And below the bumper the standard dual chrome trumpet style exhaust tips were present (one on each side). The W-30 442 had only two transmission choices – a Muncie 4-speed manual or a heavy-duty Turbo-Hydramatic 400 3-speed automatic. With both transmissions the standard rear gear ratio was 3.42 with a 3.91 ratio being optional. However if Air Conditioning was ordered with the automatic transmission a taller 3.23 ratio was mandatory. Additionally Oldsmobile had its bases covered in 1970, it offered lower racing spec rear gear ratios (which were 4.33, 4.66, and 5.00) which could not be ordered from the factory and could only be installed at an Oldsmobile dealership. 14-inch wheels were mandatory on the W-30, however there were different styles to chose from including the standard steel wheels with dog dish hubcaps. 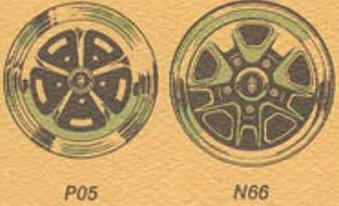 The sporty N66 wheels were a popular choice, however the chrome P05 wheels were the hot ticket for the W-30. 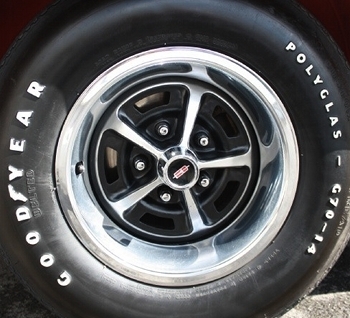 G70 tires with raised white lettering were standard. Front manual disc and rear drum brakes were also standard on the W-30. 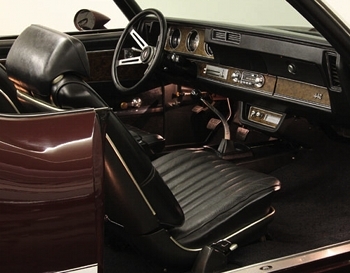 The 442’s interior was subjectively the most attractive GM A-body interior offered for 1970. It was sporty yet classy, it was exactly the type of interior one would expect of a distinguished gentleman’s muscle car. Today it’s the performance oriented upscale BMW and Mercedes models that yuppies or upperly mobile professionals prefer, back in 1970 a loaded W-30 442 was exactly the type of car these type of professionals bought. Unlike most of the current crop of modern muscle cars (with the exception of the large late-model Challenger), are starved of space, the W-30 had one big advantage, five adults could fit comfortably in the interior and a lot of luggage could be placed in the big trunk. 1970 will probably be remembered by American historians as a time of great turmoil. In 1970, the war in Vietnam not only dragged on, but was expanded to Cambodia and Laos. War protesters hit the streets and it felt as if the country was coming apart at the seams. However 1970 was a great year for muscle car fans, performance had hit an all time high for this golden era. And never again would there be such a large selection of muscle cars to chose from. Unfortunately GM would lower compression ratios across the board for 1971 and by 1972 all other automakers did the same. The Environmental Protection Agency (EPA) rolled out a host of new regulations starting in 1972 that in a few years would strangle performance, and nearly destroy the muscle car. But in 1970 all was still good with Oldsmobile, and the same was true with the 1970 442 W-30 which represented the finest performance package Oldsmobile had ever offered. For Oldsmobile performance fans, it would never be this good again.